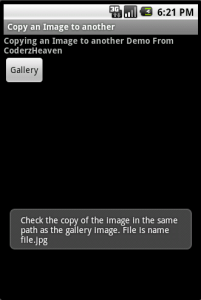 Here is a simple example to copy an image to another image file in ANDROID. In this example a button click will open the gallery and after that it will be copied to another image file. You have to check the File-explorer to find the file. This is the java code for doing it. String destinationImagePath= "/file.jpg";	// this is the destination image path. Change the name of the file as you like. Please leave your comments and click on the +1 button above. Thanks for discussing in detail about copying of image to another.This is really helpful.